The use of sound in meditation is a great way to signal the start and end of your meditation practice. The bell or chime is a call to awaking, out of thought into presence. 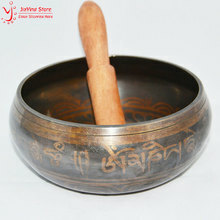 The sound of singing bowls puts your mind into a meditative state. The sound they produce can also be used as a focal point during meditation. Singing bowls, chimes or bells work well in a classroom or meeting setting. It is a good way to quiet down a noisy group or signal that it is time to return to a meeting. Try incorporating some of these sounds into to your meditation routine. AliExpress.com – Tibet six word Tingsha Bells Tibetan Manjira Cymbals 6.5cm. Try using some of these sounds during your meditation. The bells can be a great aid for staying focused and signaling the start and end of your meditation. Many of the singing bowls also make a nice decorative piece for the home.